Phthirus pubis is also known as the pubic or crab louse. 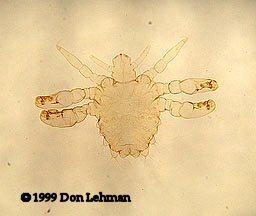 Lice have legs with claws adapted for clinging to hairs or fibers. The nymph (at right) and adults have 6 legs. The adult form is about 2 mm in length. There are three forms of lice: pubic lice, body lice and head lice. Pediculosis sp. are body and head lice. 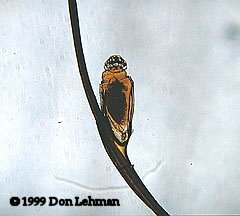 In all forms of lice, females can cement their ova (nits, image at left) to hair shafts or clothing fibers. The nits are about 0.8 x 0.3 mm.